With blue, using straight needles cast on 44 sts. Work K1, P1 ribbing for 4 rows. Continuing in blue, work stockinette (st st) for 9 rows. Now to the sheep graph! Working in intarsia, joining and cutting off yarn as needed, P9 blue, work chart (25 sts), P10 blue. Make sure that your sheep graph is the right way up. You are working from the head/back of sheep down to the legs! Continue working the graph, and change from blue to green on row number 15 of the graph. When all the graph rows have been worked continue in green only for 6 rows. Knit 1 row and place 10 sts onto first needle, 24 sts onto 2nd (front) needle, and 10 sts onto the 3rd needle. The 2 needles with 10sts each are the back needles. You now have 20 sts on one back needle. Row 1: K1, sl1, to last stitch K1. Repeat these 2 rows until 12 heel flap rows have been worked. slip 1 , k7 , SSK, turn. Repeat from * until 8 stitches remain. Cut off extra strand. Knit across 8 back sts. Pick up and K 10 sts from first side, then knit across 24 sts on needle number 2, then with needle number 3 pick up and K 10 sts from side to heel, on this same needle K4 of the sts from the back needle. needle number 3 – K1 , SSK, K to end. Finish on a 1st round. Tie on extra strand again. Slip 1 st from each end of needle number 2 on to needle number 1 & needle number 3 thus: 11-22-11. Round 1: needle number 1 – K to last 4 sts, K2tog, K2, needle number 2 – K2, SSK , K to last 4 sts, K2tog, K2, needle number 3 – K2, SSK, K to end. When all rounds have been worked and 20 sts remain on needle number 3 k the sts from needle number 1 so you have your stitches placed thus on 2 needles: 10-10. Bind off (cast off) using 3 needle method. Holding the needles parallel insert 3rd needle knit wise into the first st of each needle. There will be one st on the right needle. Repeat , there will now be 2 sts on the needle. Pass the right st over the left st and off of the needle. Repeat these steps until all sts are bound (cast) off. With small amount of blue, sew an eye on the sheep’s face. Turn sock inside out. Sew in all ends and trim off. Sew a flat seam at the back of the sock. Press gently with steam iron and damp cloth. Ok. That was easy wasn’t it? Now make the other one! Some suggestions. You could use a lighter green and add some flowers for a spring sheep. You could add texture or chenille on the ‘fleece’. 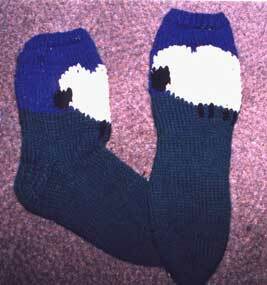 You could use a darker blue and some white to make a snow scene sock. You could add a hat, or a bell, or a bow to sheep. You could knit the sheep so they face each other.